After selecting the component type, we design the external interface of a component. The interface is the visible part of a component, whereas the implementation is hidden. The interface also hides the type of the component (atomic or composite) and the implementation language of atomic components. The interface is specified using an XML file named component.xml in the component folder. There is a template XML file under doc/templates/components/component.xml and the XML format is also formally specified using XML Schema under core/src/main/resources/component.xsd. 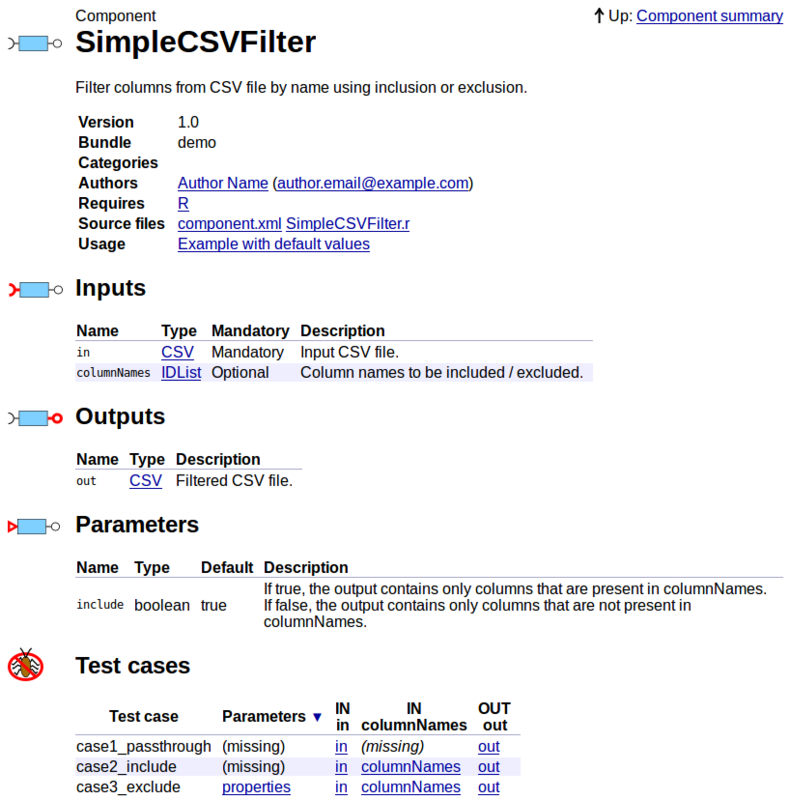 Filter columns from CSV file by name using inclusion or exclusion. If true, the output contains only columns that are present in columnNames. If false, the output contains only columns that are not present in columnNames. The name (SimpleCSVFilter) is used in Scala workflow code, so it should be recognizable and unique. Version number is used for dependency tracking; if you increase the version to 1.1, workflows using this component are subject to re-execution. We chose to use R to implement our component, and we specify this in the <launcher> section. It indicates that Anduril should use R facilities (specifically, Rscript) to execute this component. The file argument is the source file. The source argument is an additional source file for including in the component documentation. For Java and Scala components, the entry point is specified using class (a fully qualified JVM class name). The <inputs>, <outputs> and <parameters> sections define the external interface. Port types refer to types declared in datatypes.xml files, either the current bundle or dependency bundles. Array ports are specified by adding the attribute array="true". Input ports can be optional, marked by optional="true". We chose the make the columnNames port of CSVFilter optional so that the component passes CSV files through unfiltered if the second input is missing.